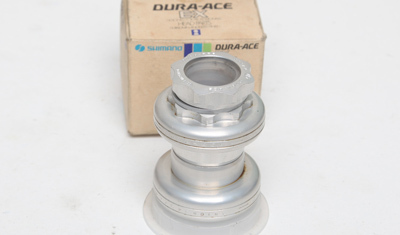 Don't forget there were some wonderful superb quality headsets other than Campagnolo and Shimano – Stronglight, Edco, Omas, Primax, Zeus and others. The Other Headsets page contains French threaded headsets, 1in threadless, 1 1/8in and 1 1/4in headsets. 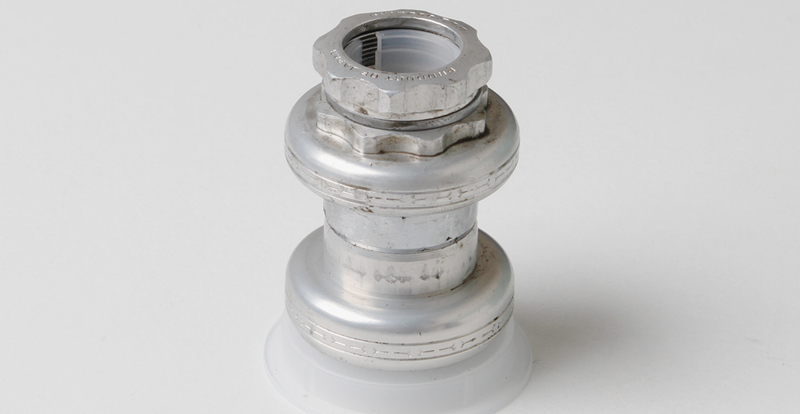 We check the headsets we sell very carefully for pitting or brinelling. All headsets we sell are free of pitting or brinelling unless it is stated otherwise in the description. Stack Height An important consideration with choosing a headset is to ensure that your new headset has a stack height the same or less than your current headset. 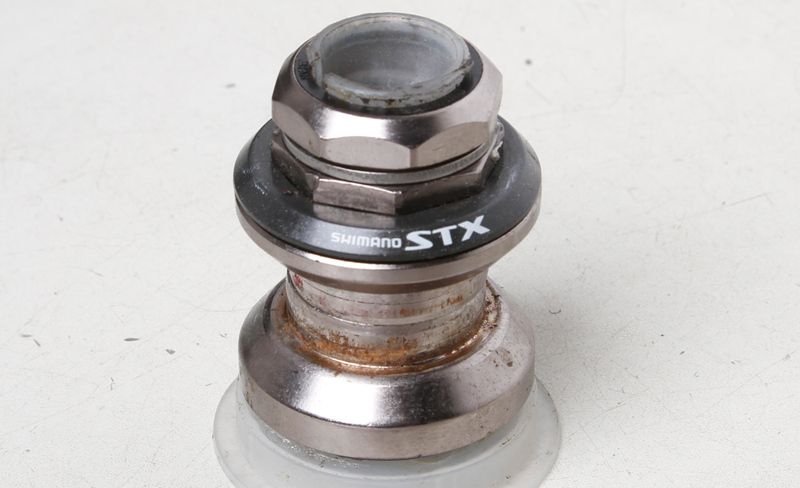 Before removing the headset measure from the bottom of the fork crown race to the the top of the lower head race where it fits into the head tube. Secondly measure theheight from the lowest part of the top frame race to the top of the lock nut. Add the two dimensions you have measured together and that is the stack height of your current headset.Your new headset must not have a stack larger than the old one. For a frame without a fitted headset measure the length of the head tube (A). Then measure the length of the fork steeer tube from the base of the crown race seat to the top the column (B). Subtract A from B and that is the maximum stack height headset you can use – you can use a headset with a smaller stack height. Fork Crown Race Seat Diameter and Head tube Insert Race Diameter Campagnolo settled on a standard crown race seat diameter of 26.4mm with an insert race diameter of 30.2mm. 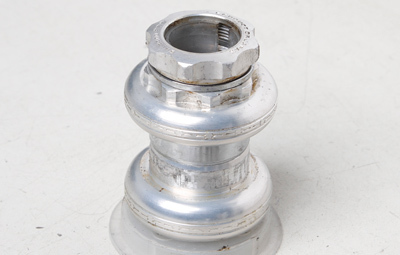 Japan with the JIS standard settled upon 27.0mm crown race seat diameter with an insert race diameter of 30.0mm which was virtually identical to that used for the most part in the UK prior to about 1975 unless a Campag headset was fitted. 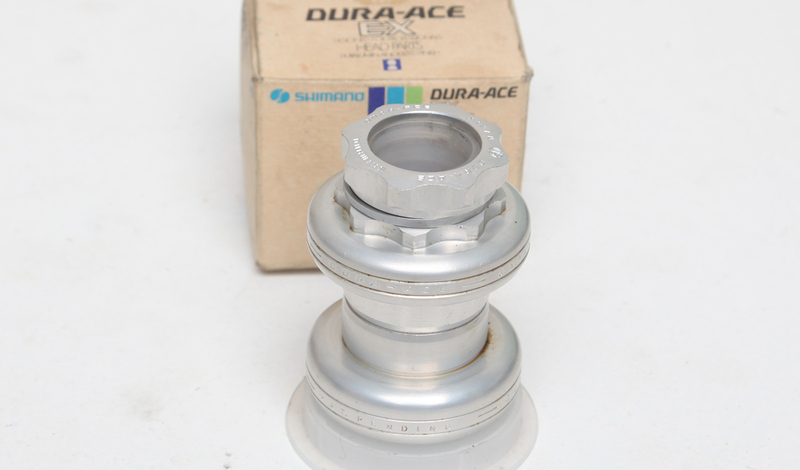 However most frames from the last thirty years use the Campagnolo standard and even the Japanese manufacturers mostly made headsets to the Campag dimensions. If your frame and fork has JIS dimensions it can easily be reamed and cut to accept Campag dimensioned headsets by a good bike shop or framebuider. 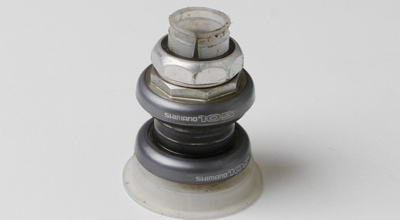 All headsets below are for 26.4mm crown race and 30.2mm diameter insert head cups unless stated otherwise. I consider (as do many others) that Italian and English threaded headsets are perfectly interchangeable – the only difference is a small one in thread angle, the pitch and diameter being identical. Headsets require expert fitting and the correct tools... I can offer a fitting service to callers for £15 which includes reaming/facing head tube.